The Minister of Finance promulgates the Circular regulating application of priority policy of customs procedures, customs inspection and supervision for exported and imported goods of enterprises. 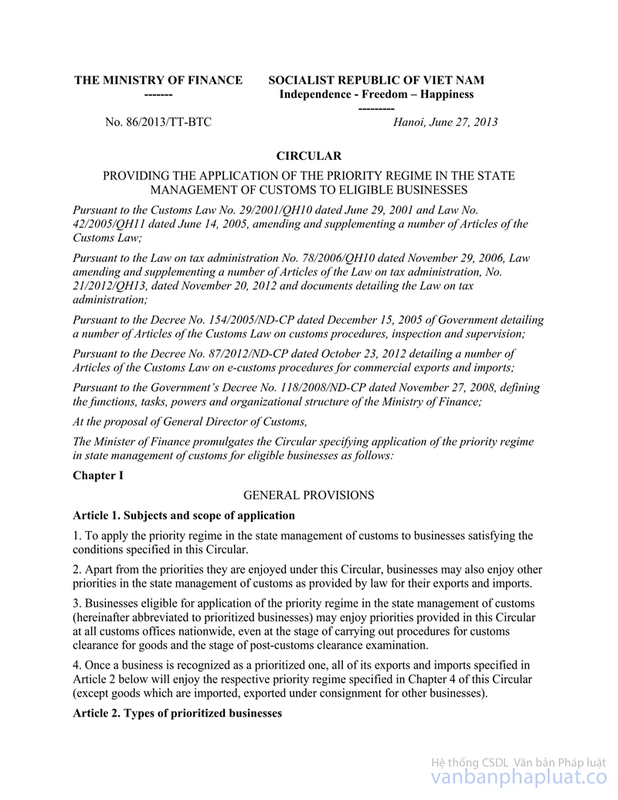 This Circular stipulates the application of priority policy in customs procedures, customs inspection and supervision for exported and imported goods of enterprises, brokers, projects permitted to apply the priority policy; procedures for verification, recognition, temporary suspension, termination and management of application of priority policy to enterprises, brokers, and projects. 1. Enterprises exporting or importing goods. 3. Organizations and individuals that import goods to carry out key investment projects agreed by the Prime Minister before being licensed to invest in the fundamental construction phase. 4. Customs authorities, tax authorities. 5. Other related organizations and individuals. 1. "Prioritized enterprise" is an enterprise exporting and/or importing goods recognized as a prioritized enterprise by customs authorities. 2. " Prioritized broker" is customs broker recognized as a prioritized enterprise by customs authorities. 3. "Prioritized project" is a key investment project which is agreed by the Prime Minister before being licensed to invest in the fundamental construction phase and is recognized the application of priority policy by the customs authorities. 1. Priority policy prescribed in this Circular may be applied to exported or imported goods of prioritized enterprises or projects, or exported or imported goods enumerated on declarations made by prioritized broker, regardless of purposes and at any customs authority. 2. In addition to the priorities defined in this Circular, the prioritized enterprise is also entitled to other priorities in the field of State management on customs for exported and imported goods in accordance with relevant law provisions. Article 5. Exemption from document inspection and goods physical inspection. 1. Relevant documents of customs dossiers shall be exempted from inspection and goods shall be exempted from physical inspection during customs procedures, except for signs of law violation or extraordinary inspections to assess the legal compliance. The Director of the General Department of Customs shall decide on the extraordinary inspection as prescribed in this Article. 2. The physical inspection of goods must be made by scanners. a. For export-processing enterprises (EPE), the physical inspection of exported and imported goods shall be made when there are signs of customs offence. b. For other enterprises, the rate of extraordinary inspection shall not exceed 0.5% of the total number of export, import declarations of the enterprises. 1. Incomplete customs declarations may be used to follow customs procedures on customs electronic data processing system of customs authority. Within thirty (30) days from the date of registration of the declaration, the declarer shall update data and related documents of the customs dossiers as prescribed in Article 24 of the Law on Customs No. 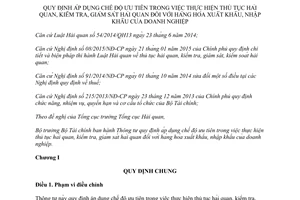 54/2014 / QH13 on customs electronic data processing system of customs authority. 2. In case the electronic data system of customs authority has problems or temporarily breaks down, enterprise is allowed to conduct customs procedures with paper declarations (form 01 / DNUT enclosed with this Circular), within 30 (thirty) days from the date of registration of the declaration, the declarer shall submit a complete customs dossier to the Sub-department of Customs where the enterprise opens the declaration. The Sub-department of Customs where the prioritized enterprise opens the declaration shall guide the prioritized enterprise to update the data of the customs declarations. 1. Enterprises shall be given priority by the customs authority for physical inspection of goods by scanners for extraordinary inspections to assess the compliance with the customs declaration. 2. In case enterprise meets difficulties in customs clearance, the Sub-Department of Customs shall reply in writing within 8 (eight) working hours from the time difficulties arise. 3. Enterprise shall be allowed to undergo customs inspection/control first by the customs authority. 4. In case an enterprise wishes to check or take sample of goods, it will be allowed to do so. 5. Enterprise shall be given priority for loading, unloading, transfer and receipt of goods by port/warehouse operator. 1. In case goods are subject to specialized inspection, the customs authority shall accept the declaration of enterprise on goods meeting the specialized regulations for customs clearance. Enterprise shall retain adequately the specialized inspection results of competent state management agencies and present them upon request of the customs authority. 2. Enterprise is allowed to transfer imported goods to its warehouses for preservation while awaiting specialized inspection results. 3. In case it is necessary to take samples for inspection, enterprise shall be given priority for sampling the goods. 1. Tax shall be refunded first and inspection shall be conducted later. 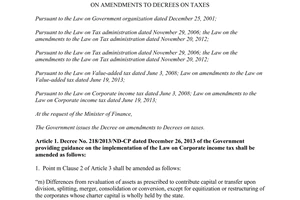 The application for tax refund, tax refund procedures shall comply with the provisions in Circular No. 38/2015 / TT-BTC dated March 25, 2015. Based on the result calculated by the enterprise, the customs authority shall inspect the suitability of the application. The decision on tax refund shall be issued within 01 (one) working day from the date of receipt of a satisfactory application of the enterprise. 2. Enterprise shall be allowed to submit the annual statement for imported goods for processing, imported goods for export production within 90 (ninety) days after the end of fiscal year of the enterprise. Based on such annual statement, the customs authority shall enter data into the customs electronic data processing system as prescribed before conducting inspection. 3. The inspection for the cases referred to in Paragraph 1 and Paragraph 2 of this Article shall comply with the provisions of Article 25 of this Circular. 4. Enterprise shall be given priority in tax procedures for exported and imported goods in accordance with regulations of legislation on taxation. 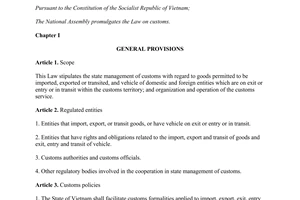 Indirectly exported and imported goods (goods that are delivered to another entity in Vietnam appointed by the overseas importer); raw materials, components and spare parts used for production of enterprises bought from bonded warehouses may be imported before customs declaration. 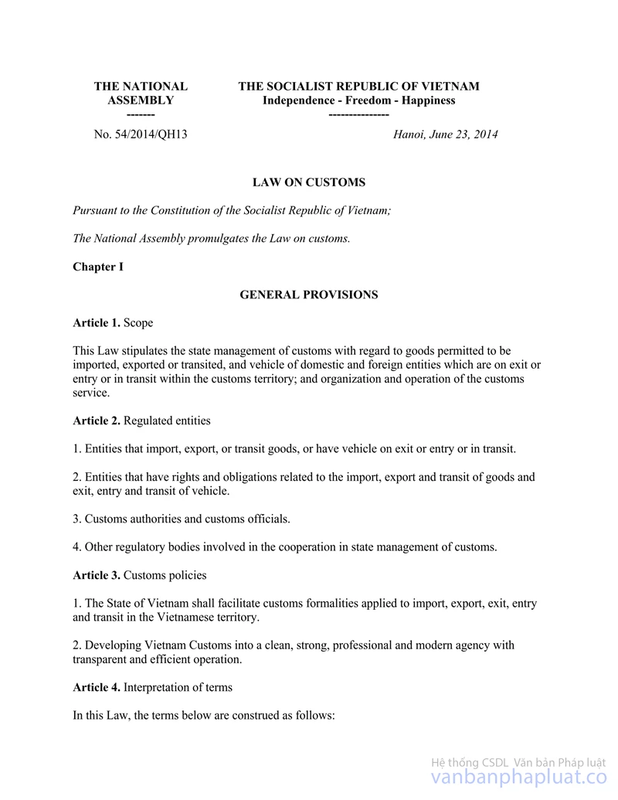 The customs procedures shall comply with Clause 6 of Article 86 of Circular 38/2015 / TT-BTC dated March 25, 2015. 1. Enterprise shall be given priorities for exemption of post-clearance inspections in declarer’s premises except for signs of law violations. 2. The customs authority shall conduct post-clearance inspection at the declarer’s premises of not more than once over 3 consecutive years on the basis of risk management from the date it is recognized as a prioritized enterprise by the Director of the General Department of Customs except for signs of violations of legislation on customs. 3. The Director of the General Department of Customs shall decide on post clearance inspection in declarer’s premises. 3. A customs broker may only apply priority policy if the number of its declarations that incur administrative penalties for tax/customs offence by the Director of the Sub-department of Customs (or a person holding an equivalent title) does not exceed 0.5% of the total number of declarations that have undergone customs procedures. 4. Priority policy may only be applied if there is no overdue tax. Article 13. Required export and import turnover. 1. The enterprise earns at least USD 100 million in annual turnover from import, export. 2. The enterprise earns at least USD 40 million in annual turnover from export of goods manufactured in Vietnam. 3. The enterprise earns at least USD 30 million in annual turnover from export of goods being agriculture and aquatic products manufactured or grown in Vietnam. 4. The annual number of customs broker’s declarations undergone customs procedures is at least 20,000 declarations. Export and import turnover specified in Clauses 1, 2, 3, 4 of this Article is an average turnover of 02 (two) last consecutive years before the date on which the enterprise submits a written request for consideration, excluding turnover from entrusted export and import. 5. 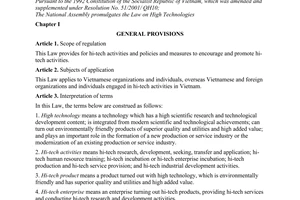 The required export and import turnover mentioned above shall not be applied to the enterprise recognized as a high-tech enterprise by the Ministry of Science and Technology under the provisions of the Law on High Technology. Electronic customs procedures, electronic tax procedures must be followed; there must be export/import management software programs meeting requirements of the customs authority. Payment for export and import consignments is made through banks as stipulated by the State Bank. Enterprises shall notify the customs authority the account number and the list of transaction banks. e. The commendation certificate, quality certificate (if any): 01 photocopy. b. The investment certificate, economic and technical report: 01 photocopy. 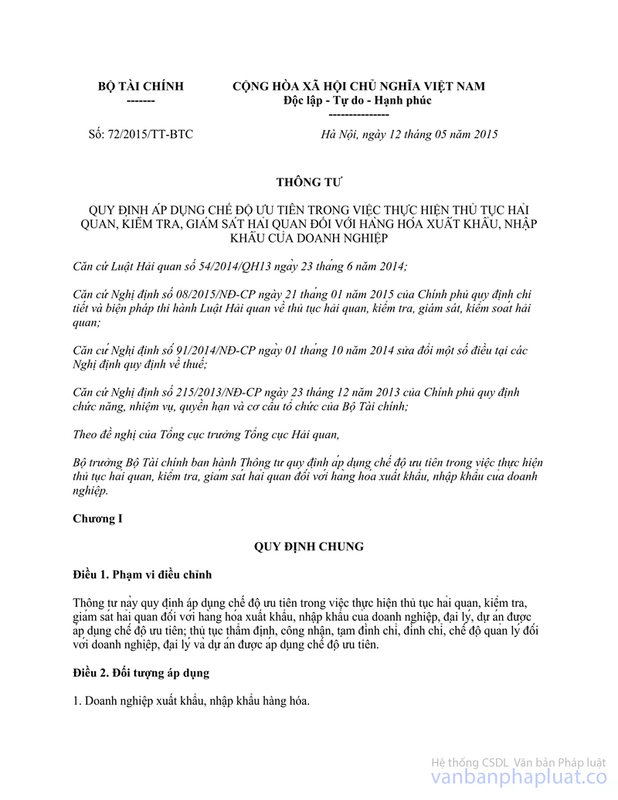 The Customs Departments in provinces and cities shall inspect completeness, legality, validity of the applications submitted by enterprises under the provisions of Clause 1 of Article 18 of this Circular; compare information provided by enterprises, collected information about the enterprises in administrative areas with conditions for application of priority policy specified in Chapter III of this Circular. In case enterprise does not meet the conditions for application of priority policy as prescribed, the Customs Departments in provinces and cities shall make a reply in writing and clearly state the reasons. a.3. Post-clearance inspections in the declarer’s premises to assess compliance with the law if over the last 24 (twenty four) months, before the date on which enterprise submits a written request for recognition of prioritized enterprises, enterprise has not been conducted post- clearance inspections to assess compliance with the legislation on customs and the legislation on tax. On-site inspection in enterprises or projects shall be made within ten (10) working days, not including the time for processing the post- clearance inspection conclusion if post-clearance inspection must be carried out at the declarant’s premises. b. At the end of the physical inspection, including the time of post clearance inspection (if any), within 05 (five) working days, the customs unit shall inspect and make a report on results of documentary inspection and on-site inspection and submit to the General Department of Customs. 1. 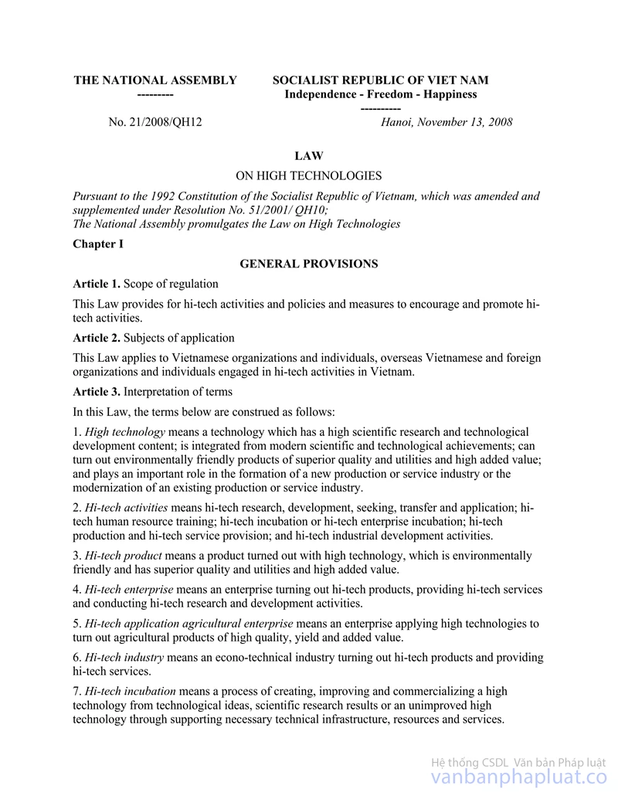 If the enterprise fails to satisfy all conditions according to the reports of the Customs Department of the provinces and cities, customs data, other collected information and verification results of additional information (if any), the General Department of Customs shall send a notification to enterprise and provide explanation. 2. In case enterprise meets the conditions for application of priority policy, within 10 (ten) working days, the Director of the General Department of Customs shall sign the Decision on recognition of prioritized enterprises (form 03 / DNUT enclosed with this Circular). 1. 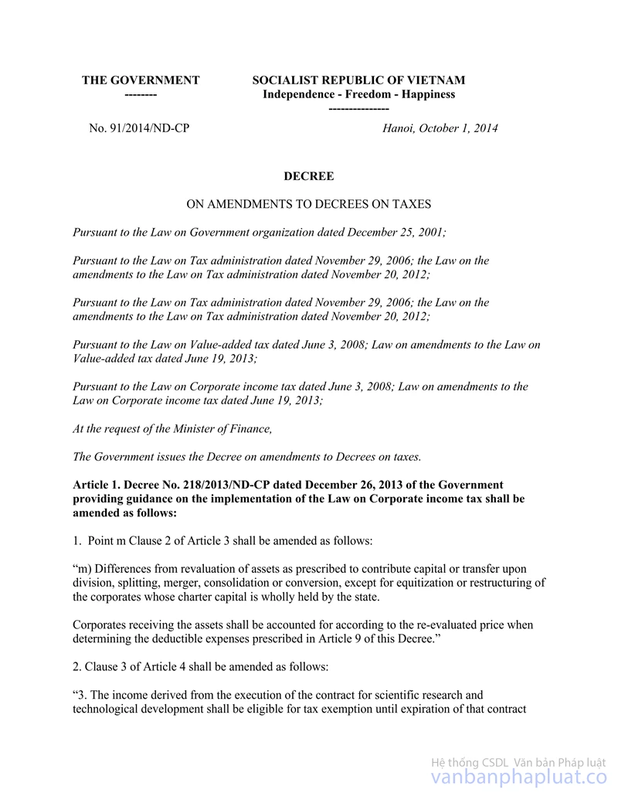 In case enterprise has not fulfilled its responsibilities as stipulated in Article 45 of the Law on Customs when being notified by the customs authorities, the customs authority shall suspend the application of priority policy for 60 (sixty) days (Decision on suspension shall be made using the form 04 / DNUT enclosed with this Circular). 2. During the suspension period, the prioritized enterprise shall fulfill its responsibilities as stipulated in Article 45 of the Law on Customs and remedy errors (if any), the customs authorities shall cancel the decision to suspend the application of the priority policy (Decision to cancel Decision on suspension shall be made using the form 05 / DNUT enclosed with this Circular). 2. In case enterprise is subject to termination of priority policy it shall not be considered and recognized as prioritized enterprises by the General Department of Customs in 02 (two) next years. 3. The decision to terminate shall be made using the form 06 / DNUT enclosed with this Circular. The Director of the General Department of Customs shall decide the recognition, suspension and termination of the application of priority policy. 1. The tax authority where enterprise is registered shall cooperate with customs authority to assess compliance with the laws on domestic taxation, adherence to electronic tax procedures, fulfillment of the obligations to pay domestic taxes of the enterprise. 2. Within 10 (ten) working days from the receipt of the written request of the customs authorities, tax authorities shall make a reply in writing. 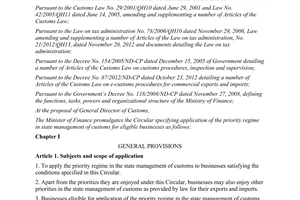 Every three (03) years, the General Department of Customs shall assess the conditions for application of priority policy, assess compliance with customs law, tax law to automatically extend priority policy for prioritized enterprise; inspect the tax refund and annual settlement (if any) on the basis of risk management under Paragraph 3 of Article 9 of this Circular. 1. Comply with customs legislation, tax legislation, accounting and auditing legislation. 2. Make and submit electronic quarterly reports (form 07 / DNUT enclosed with this Circular) to the General Department of Customs. 3. Provide the customs authority with financial statements, audit reports of previous year within 90 (ninety) days after the end of the financial year of the enterprise. 4. Conduct self-inspection, detect and remedy errors, report to the customs authorities; maintain the conditions of prioritized enterprises. 5. Inspect and report fully and promptly issues notified by customs authority when the customs authority notifies errors or unclear issues in customs dossiers. 6. 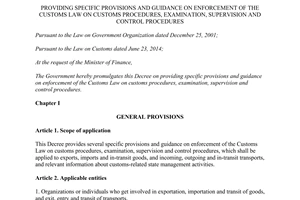 Notify the General Department of Customs of the list of customs broker providing services to enterprise. 1. The Director of the General Department of Customs shall base on provisions in this Circular to direct and guide customs units in implementation. 2. All relevant organizations, individuals and enterprises shall be responsible for the implementation of this Circular. 1. This Circular takes effect after 45 days from its signing. 2. This Circular replaces Circular No. 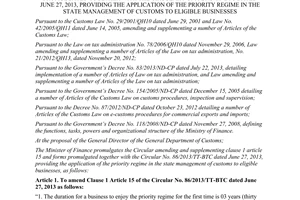 86/2013 / TT-BTC dated June 27, 2013 and Circular No. 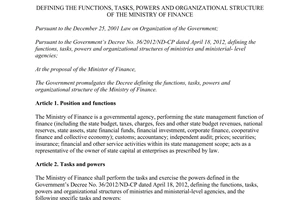 133/2013 / TT-BTC dated September 24, 2013 of the Ministry of Finance. 3. Enterprises that have been recognized as prioritized enterprises as prescribed in Circular No. 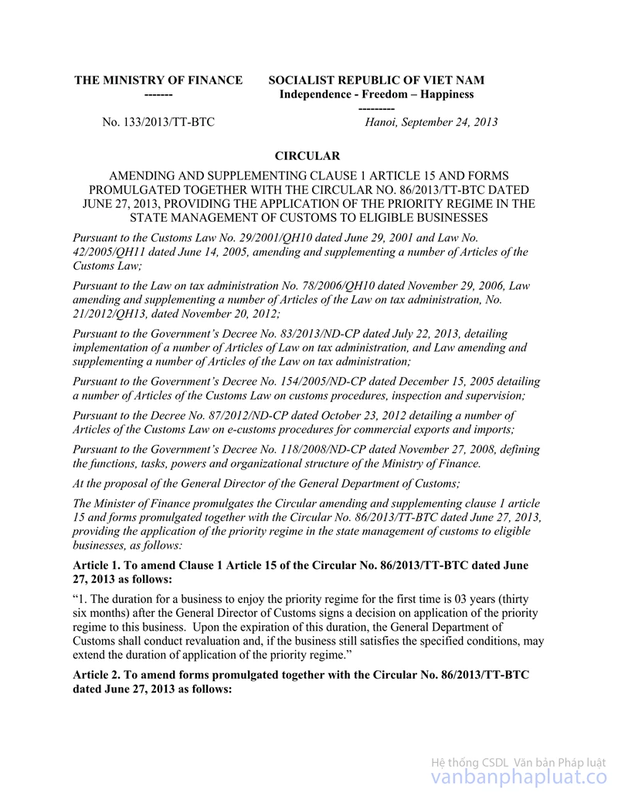 86/2013 / TT-BTC dated June 27, 2013 and the Circular No. 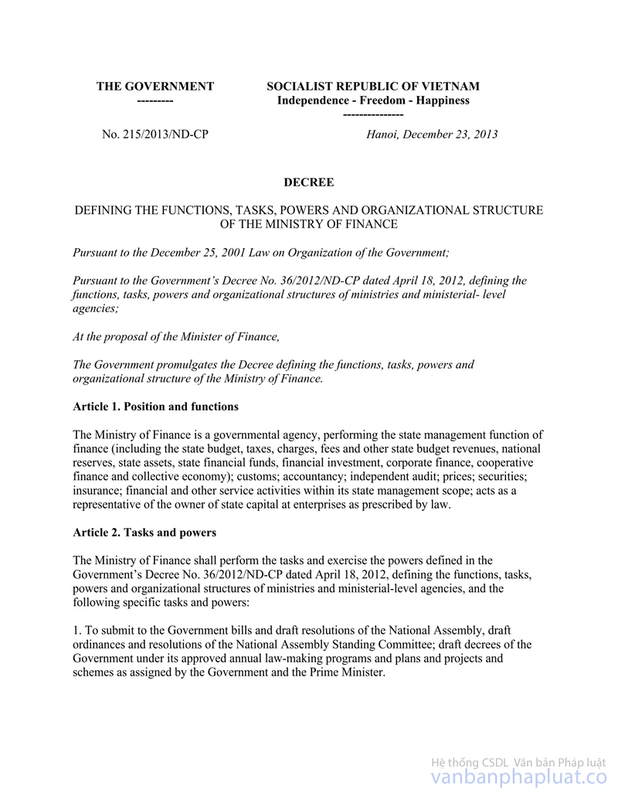 133/2013 / TT-BTC dated September 2, 2013 of Ministry of Finance shall continue to apply the priority policy under the provisions of this Circular. /.